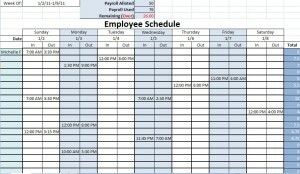 You can track your employees’ daily work hours and weekly overages with the Printable Work Schedules Template from Microsoft. Download the printable Excel work schedule that is available on this page for free today! Use this printable work schedule calendar to track hours worked, vacation time and sick days for all of your employees. With this clear template, you can make sure you or your employees never miss a shift because of bad scheduling, and there is never any question about when an employee works. This easy to use printable work schedule is available for free download and immediate use. Simply fill in the cells, print and hang on the wall of your workplace or home for easy access. The printable work schedule includes space to note payroll hours allotted, payroll hours used and payroll hours remaining to help ensure employee scheduling stays on budget and efficient. This work schedule is one of our most popular template designs for the office and features easy-to-use cells that make scheduling simple. Make sure coverage is accurately calculated and every hour accounted for to maximize profit and use your labor force to its full potential. Download this printable work schedule template today and get your labor force back on track and making money. We will revise and update immediately!